The forex market is perhaps the most complex of all the four principle capital markets. So it is little wonder so many traders struggle to achieve longer term consistency, and profitability in this most challenging of markets. And indeed some of these very traders, ignore volume as they mistakenly believe it has no validity, given the fact the forex market operates with no central exchange. But in the world of forex, volume is tick activity, and activity is volume. 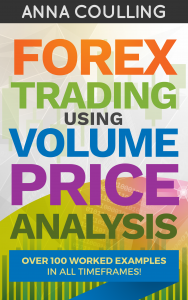 In this book I aim to demonstrate that volume price analysis is a valid and powerful solution, and one which will help you become consistently profitable in the forex market. The application of volume price analysis can be traced back to the iconic traders of the past century. Trading greats such as Charles Dow, Jesse Livermore, Richard Wyckoff and Richard Ney. All used volume and price to build their fortunes. Today, we have brought this methodology up to date and based on the codified laws of Richard Wyckoff. Here you will find over 100 worked examples in all timeframes, clearly annotated and with detailed descriptions, to illustrate how the power of volume price analysis can help you in your forex trading. And better still, VPA or volume price analysis is an approach you can integrate into your existing trading style. There is no need to change or abandon your existing trading tactics, something many of my readers have confirmed with their public comments on my other books on Amazon. Forex trading using volume price analysis is available in both Kindle and paperback formats.